INFINITI of Boerne near Laredo, Texas has a huge selection of INFINITI QX60s available for purchase! Featuring a striking and modern design, the all-new INFINITI QX60 is the luxury crossover you never knew you needed. A supreme blend of opulent materials, driver comfort, and smooth driveability, the 2019 INFINITI QX60 has a strong sense of functional elegance that cannot be ignored. Let’s dive in and learn a little bit more about this invigorating new model now. Click here to see our current inventory now! Design: The design of the 2019 INFINITI QX60 is exquisitely one of a kind. The center console, for example, draws its inspiration from Fuki-Urushi, the traditional Japanese craft of delicately applying layers of lacquer across wood grain in order to preserve the natural tone. Seating for seven crafted out of high-quality leather also provides a luxurious experience for everyone, regardless of where they sit in the cabin. We carry an exceptional selection of genuine INFINITI QX60 accessories, so your choice can reflect your unique sense of style. 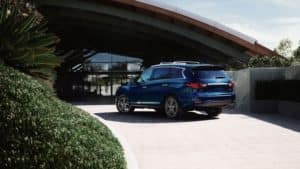 Technology: On top of its immaculate design, the 2019 INFINITI QX60 also has some of the most current automotive technology that’s available on the market today. Dual 8” screens are available so passengers in the rear can watch movies or play games with wireless headphones while front-seat riders enjoy premium Bose Cabin Surround sound–there’s even a space specifically designed for the storage of your wireless accessories, too. Onboard safety tech features like Lane Departure Prevention, Forward Emergency Braking with Pedestrian Detection, and Backup Collision Intervention all work hard to keep both your QX60 and your precious passengers safe whenever you’re on the road. Performance: Although the all-new INFINITI QX60 may have been crafted with families in mind, the designers at INFINITI know that powerful performance is important, too. That’s why the 2019 INFINITI QX60 comes standard with a 3.5-liter V6 engine that can put out a staggering 295 horsepower, for all your speedy needs. Available Intelligent All-Wheel Drive also controls wheel power gives you the most handling when traveling in unfavorable weather conditions. Want to take home an all-new INFINITI QX60 of your own? 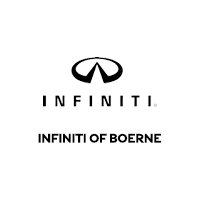 Click here to visit INFINITI of Boerne today!